Greg Farries: How did you get started in political cartooning? Graeme MacKay: Ever since I was a little kid, I’ve always had an interest in the news. That may well be due to the fact that my parents subscribed to newspapers and made a point of exposing the kids to the TV news on a regular basis. Naturally, all the absorption of news, combined with my enjoyment of drawing, led to the beginnings of my interest in political cartooning. Greg Farries: What advice would you give to someone interested in becoming a political cartoonist? Graeme MacKay: The only way to get good at drawing is to practice. Practice more, and then practice more after that. Just because a parent or friend fawns over a beloved’s cartoons does not ensure he or she has the stuff to become an editorial cartoonist. The person also has to have knowledge of, and a firm interest in, the news. Good drawing skills and a good grasp of what’s going on in the world may be the key elements needed to create good cartoons, but combining the two is a tricky thing, and – if successful – it is possible to measure up to the work of the professionals. Just be prepared for a lot of letdowns upon pursuing a job as a political cartoonist. The number of local editorial cartoonists working at newspapers is shrinking by the year as cost-cutting is forcing early retirement and leaving vacancies – filled by the work of cartoonists working far away at bigger newspapers. With only 20 to 25 staff cartoonists now working in Canada, the chances are greater of becoming a professional hockey player than an editorial cartoonist. Still, there will always be a place for visual political satire, in some form, alongside news and commentary. Greg Farries: Where do you get your inspiration and ideas for your political cartoons? Graeme MacKay: Inspiration comes from what I see going on in the news. Out of the five cartoons I create a week, I try to draw at least one of them on a local issue. The rest varies, from provincial matters to world events. Tomorrow’s news often doesn’t start to become obvious until noon, when the policy issues emerge on the network news and Internet sites. I’m usually inspired in drawing on a subject at that time. For me an idea for humour often begins by coming up with some sort of visual that I think will be amusing to the reader. A suitable gag for a caption follows. There are several things I try to avoid when putting together a cartoon. Metaphors and clichés can be useful when used wisely, but I find they’re often overused by cartoonists. Certain scenarios are also overused by cartoonists, for example, two people sitting in conversation on a couch watching TV, or two people in conversation about something going on as described in a headline on a newspaper one of them is holding. Relying on a text- heavy gag with nothing visually amusing does not make a good editorial cartoon - it’s boring and unimaginative. I see this done by other cartoonists all the time, and I don’t think it’s doing a valuable service to the craft of editorial cartooning. Greg Farries: In most cases political cartoons are critical of the subjects they are conveying. As a political cartoonist, how do your balance your own personal opinions with the topics and individuals you draw? Or, more accurately, do you try to approach your subjects with strict objectivity? Is strict objectivity even possible? Graeme MacKay: It’s impossible to be an objective editorial cartoonist. Even before applying ink to paper the process of selecting the subject of the cartoon has taken on a biased approach – simply by focusing on one issue while leaving other for another day, or ignoring an issue completely. A cartoonist can’t avoid mixing in personal opinion in whatever’s drawn, however the bias should really only be conveyed in a subtle way. I tend to stay in the ideological centre, sometimes challenging popular opinion, reflecting popular opinion, or provoking a little chuckle from the reader. Greg Farries: Political cartoons have the power to elicit strong emotions – consider the Danish Muhammad cartoon controversy. Has the potential for controversy ever stopped you from drawing a particular subject? Graeme MacKay: I’ve learned over the years that being too heavy-handed against a politician or issue will often cause me to cringe the next morning when I open up the paper. Offending readers doesn’t do any favours – in terms of ensuring your employment at a paper – so I’ve mellowed somewhat since first starting out in this job. Keep in mind that my newspaper is the only daily paper in town with a broad readership from across the political spectrum. Generally speaking, editors don’t mind running the odd provocative cartoon, but they’ll usually avoid printing the ones that are going to be controversial. After all, it’ll be their job to field the angry calls defending their reasoning for publishing the cartoon in the first place. Greg Farries: Did you agree with the publication of cartoons depicting the Islamic prophet Muhammad? Graeme MacKay: The publication of the Muhammad cartoons was an interesting but needless act of offending Muslims. It was a case of a newspaper doing exactly the opposite of avoiding controversy, and actually orchestrating a controversy. Editorial cartoonists weren’t acting independent, as is the custom, but the illustrators (not to be confused with editorial cartoonists) were assigned the task (in the form of a contest) to depict the Islamic deity Muhammad. An artist has the right to express himself or herself however he or she wishes. A newspaper has that same right, but is responsible for the feedback and criticism following publication that may result – whether it’s in the form of letters or embassy bombings. The role of editors isn’t just to ensure correct spelling and grammar, but to act as filters, keeping the tasteless content off the pages and avoiding libellous stuff that’ll lead to expensive lawsuits. This all said, the depiction of any deities are out of the realm of what I draw on a day-to-day basis. Greg Farries: In general terms, how do you see political cartoons impacting citizens and the political discourse? Graeme MacKay: Local cartoons tend to have the most impact on readers and the politicians being skewered. A prime minister or premier gets judged, critiqued, and ridiculed on a daily basis – not just in cartoons, but in newspaper columns, on talk radio shows, and satirical TV shows. Local politicians often escape the scrutiny that comes in the form of editorial cartooning, but when it hits them, I don’t believe they can escape a bit of the impact it may have on voters. Greg Farries: Do you see your personal work in the same manner? Graeme MacKay: While I respect those who choose to put themselves up for election for the sake of public service, their performance needs to be in-check, and, if they abuse the positions they’ve been elected to, either by overspending, saying stupid things, slacking off, or turning their public office position into a career, they need to be made fun of. Greg Farries: Who is your favourite political cartoonist? Graeme MacKay: The late, great 18th century British cartoonist, James Gillray. Graeme MacKay is The Hamilton Spectator’s resident editorial cartoonist and lives in Hamilton, Ontario. For more information on Graeme, check out his personal website, MacKay Editorial Cartoons or visit Maple Leaf Web’s Polititical Cartoon section, where we feature a number of Graeme’s high quality cartoons. 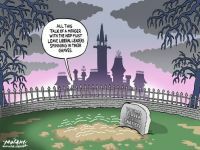 New Cartoonists on Maple Leaf Web!